A meatless main dish salad composed of roasted root vegetables like beets, carrots, and potatoes over tender bok choy, topped with a fried egg. This vegetarian main dish salad is perfect for the season when your body wants Spring but the view outside the window hasn't quite caught up yet. About this time of year, as the days are getting noticeably longer and the time change means I've got more light available in the evenings, I start craving fresh food. I haven't used a winter Community Supported Agriculture (CSA) farm share before, but my Strategic Winter Squash Reserve is proof that much of the Fall harvest can be enjoyed months later if properly stored. I need more than just long-storing root vegetables, though. I crave leaves! When I am lucky to find a farmer growing winter greens I make good use of their produce. This Winter Salad is a tasty way to enjoy some mild cold weather greens like bok choy or spinach. I first got the idea for raw bok choy in a salad thanks to Alanna's lyrical descriptions of her Bok Choy Salad with Creamy Vinaigrette. Young tender small leaves are best for eating raw in salads. Use the more mature larger plants in Fish Tacos or Yakisoba. Like my Simple Green Soup recipe, this is more of a concept than an actual step-by-step recipe. I roast whatever veggies I have on hand when I have time to watch them in the oven. Current favorites are beets, sweet potatoes, white potatoes, carrots, and rutabaga. I've also enjoyed delicata & butternut squash and turnips. Since roasted vegetables keep in the fridge for several days, I can roast a big batch of vegetables on the weekend and use them in quick weeknight meals throughout the week. When I'm ready to fix dinner I'll gently warm enough roasted vegetables for our meal--at least 15 minutes in a 350 Fahrenheit oven takes the chill off and the microwave is even quicker. I chop up baby bok choy or tender spinach for each plate and work on frying eggs in my cast iron skillet. By the time the eggs are cooked and the veggies are warmed, it's a simple matter to pile everything on the leaves, season, and eat. I like an over easy egg, using the runny yolk as my salad dressing and tossing it all together once everything is assembled. 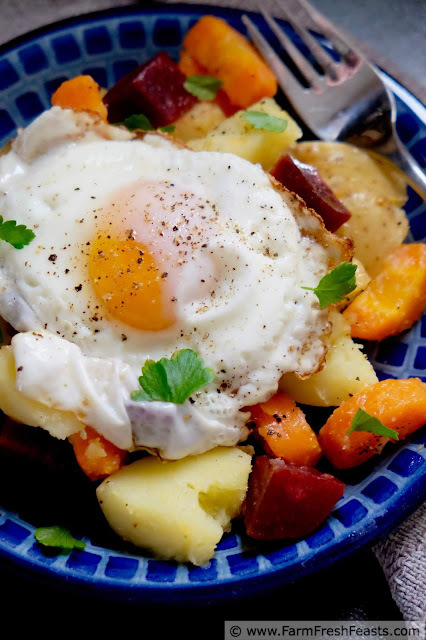 If you prefer poached eggs, this recipe would be a terrific use for a poached egg. If you'd rather have a proper salad dressing, toss the leaves with a vinaigrette before layering on the roasted vegetables and egg. Notes: I tend to Roast First, Figure Out What's For Dinner Later when it comes to vegetables, so I often have roasted vegetables on hand in the Fall/winter. Conversely in the summertime I Grill First, Figure Out What's For Dinner Later. This way when I get home in the afternoon I'm not starting from zero. I can gently warm the vegetables while I chop the greens and preheat my cast iron skillet to fry the eggs. Since I roast the veggies ahead of time when my schedule is open, this is a quick weeknight meal. To roast most vegetables I preheat the oven to 400 degrees Fahrenheit and line a rimmed baking sheet with parchment paper for easy clean up. I peel butternut squash, carrots, rutabaga, sweet potatoes and turnips but I leave delicata and white potatoes unpeeled. Either way, I cut the vegetables into bite sized chunks, toss with a Tablespoon or two of olive oil, and season with a teaspoon or two of seasoning. Current favorite blends are Penzey's Northwoods, Crazy Jane's Mixed Up Salt, Crazy Jane's Mixed Up Pepper, or Columbia All Purpose Seasoning. After I toss the vegetables in the seasoning, I'll spread them on the prepared pan and place in the oven for 20 minutes. At that point I'll stir the vegetables and check for doneness. Depending on the size of the pieces they may be ready to come out, or they may need another 10-20 minutes. Beets are a different story--these days I am steaming them in my Instant Pot, but wrapping whole unpeeled beets in foil with a splash of olive oil then roasting 45-60 minutes until tender before rubbing off the skins and cubing into bite-sized pieces is a great way to prepare. Just remember to keep the beets separate until you're ready to plate your salad or the color will leak all over your other vegetables. If you're reading this and it's NOT winter where you are, let me help you recall what winter feels like with this short video! 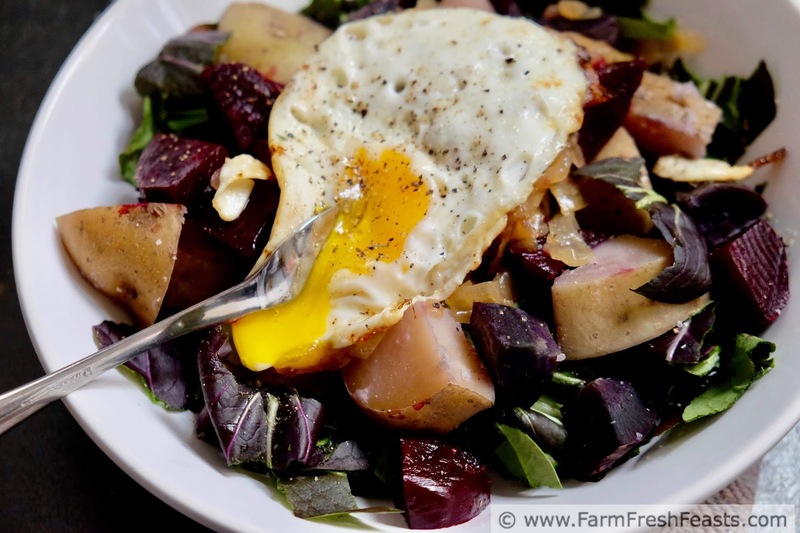 A meatless main dish salad recipe composed of roasted root vegetables like beets, carrots, and potatoes over tender bok choy, topped with a fried egg. Chop greens into bite sized pieces and add to plate. Warm roasted vegetables (if previously roasted and chilled). Fry egg to desired doneness (I prefer over easy). Top greens with warm roasted vegetables. 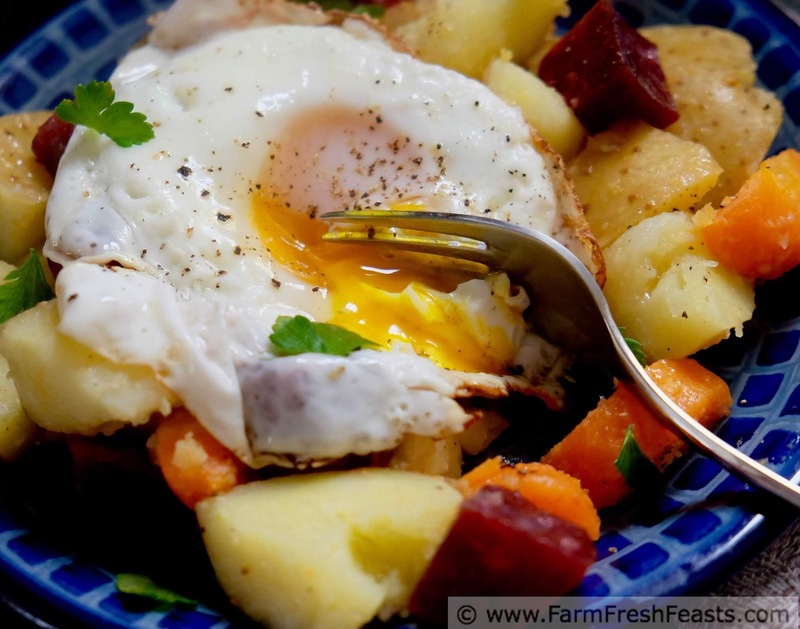 Top roasted vegetables with fried egg. Season egg. Mix everything together, to coat it with the yolk. Enjoy! 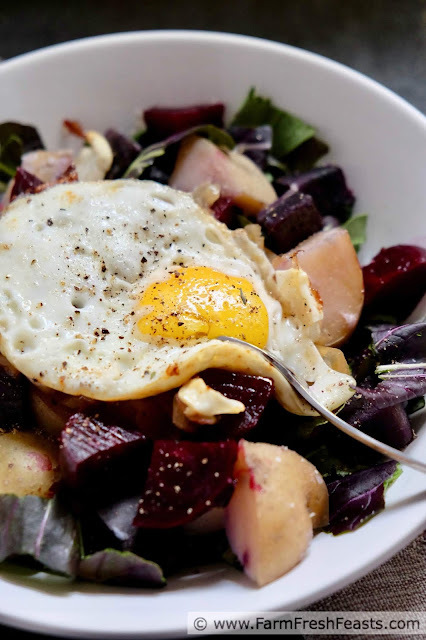 For more recipes using beets, please see my Beet Recipes Collection. For more recipes using bok choy, please see my Bok Choy Recipes Collection. For more recipes using carrots, please see my Carrot Recipes Collection. For more recipes using spinach, please see my Spinach Recipes Collection. These collections are part of the Visual Recipe Index by Ingredient, a resource for folks like me eating from the farm share, the farmer's market, the garden, the neighbor's garden, and great deals on ugly produce at the grocery store. My spell check has been working overtime on this post--constantly changing B-O-K to B-O-O or B-O-Y or B-O-O-K and changing C-H-O-Y to C-H-O-W or C-H-O-P or C-H-O-O. I hope I've caught and corrected all of the computer's misguided attempts to set me straight. Thanks for the recipe. It is very good for health. Especially for men, because I learned here that men may have some intimate problems with age.